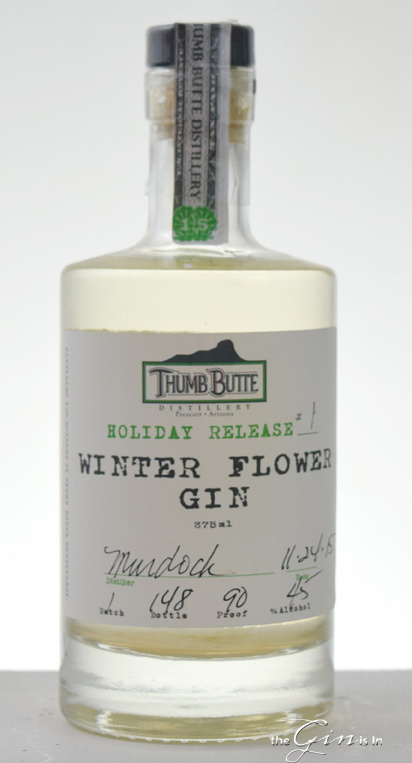 From Prescott, Arizona the team at Thumb Butte Distillery seeks to capture the essence of the local. Each step from the growing of the grain to the bottling of Winter Flower Gin happens in Arizona. Thumb Butte Distillery operates out of Whiskey Row in Prescott. This one small stretch in the early 20th century had 40 saloons. Imagine a stretch of saloon after saloon, with cowboys, gamblers, and all the other stereotypical western cliches. [more on Whiskey Row’s history] But amazingly no one had been distilling on Whiskey Row since the 1930’s, that is until Thumb Butte opened up. Yes, they do make a whiskey. 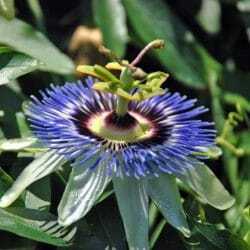 The Passion Flower is immediately recognizable for it’s incredibly distinctive blossoms. These plants often take the form of vines and while the family Passifloraceae has a nearly global tropical span, there are nine species that call the United States home. Passion fruits are well known delicious fruits, but the leaves, roots and flowers had an important place in the medical culture of indigenous American peoples. The leaves were brewed into a tea to combat insomnia; or alternatively dried themselves and smoked. Upon first pour, notes of fennel, caraway and rye bread emerge from the gin. The strong spice character is largely dominant, with slight hints of citrus and an incredibly dry juniper and coriander note; anise largely makes up the low notes. But again, that caraway-like spice (which amazingly isn’t even listed as being among the botanicals, which suggests that something else in there may be causing this- fascinating!) carries the day. On the palate, it’s a robust and strongly botanical blend. Dry coriander at the fore, dried flowers in the mid-to-late palate; juniper comes on a bit later with a very dry, crisp, almost in-itself “dried juniper berry” character. Slightly green wood notes and aniseed towards the finish. Those caraway-like notes seem to come through here as well; however, this time it’s a bit more fennel and anise than caraway oil. The finish is medium to long with a good deal of heat; the spirit certainly warms in the back of the throat. Second and third tastes I’m starting to pick up more of the citrus in Winter Flower Gin. I’m really beginning to pick up more tangerine and lemon within that peculiar caraway tone to the finish. It’s a fascinating spirit that isn’t as floral as it may seem based on the name. It’s more spice led; however, I like how the flowers don’t overwhelm. It’s rare among gins that you get an Elderflower gin that doesn’t scream Elderflower. It’s thoughtfully applied in here and nicely balanced. I didn’t really pick up anything too overtly “Holiday” themed about Winter Flower Gin. So don’t think that you need to find some festive seasonal cocktails to do it justice [though a Holiday Gin Punch would be delicious]. While not necessarily refreshing, I found it to be a bit too spiced and complex for the Gin and Tonic or Gin Fizz. I liked it much more in some serious cocktails, such as the Martinez or the Negroni. It pairs nicely with vermouth in general, and think that it’s flavors are a nice complement. Might I suggest the Alaska Cocktail or the Pascal Martini? Winter Flower Gin is an intriguing limited edition gin that likely has too little floral character for those buying it based on the name alone, and too little juniper for those who demand a lot of juniper. It’s a delicious and unique gin, just one that might not satisfy a lot of the expectations set by the bottle. Overall, a good spice-forward gin for cozy, full-bodied cocktails. Honestly, I just sip this one straight, room temperature. It's unusual to find a gin you can do this with, so I just savor it.